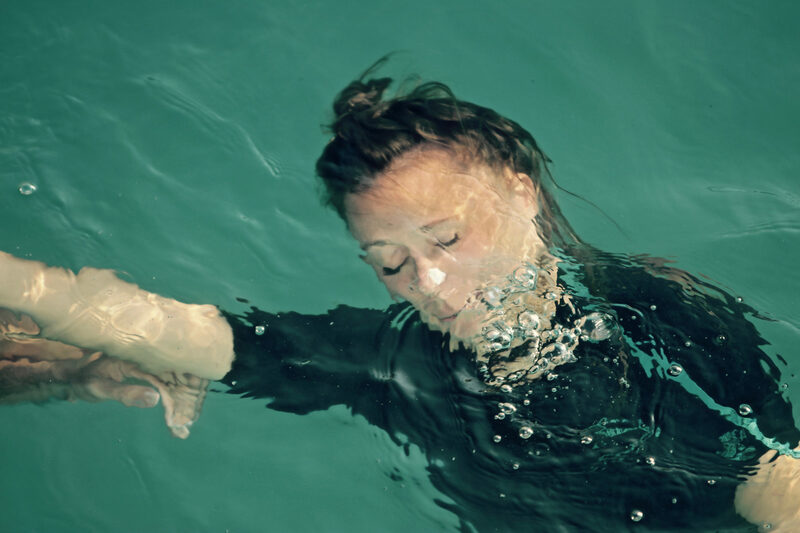 In this training we explore solo movement, contact improvisation and waterdance using elements inspired by Body-Mind-Centering as a point of departure. We explore our bodies` anatomy and movement abilities in relation to gravity and to different objects or subjects in space. Sensing ourselves, moving from within, connecting to our inner wisdom and need to move, touch and explore our environment with a playful and curious mind in a safe setting in water and on land. Especially inspired I feel from remembering the fact that we all have already spent the first nine months of our existence in a watery environment – our mother`s womb. In my experience reconnecting to the element of water, exploring movement in water and finding inspiration from in water-living creatures can be a great source of finding softness, permeability, connectivity and three-dimensionality in movement as well as a sense of comfort, freedom, support and joy in our being. Through somatic explorations based on the developmental movement patterns described by Bonnie Bainbridge Cohen, hands-on-work and pathways we deepen our understanding of our resting and moving bodies as well as our contact improvisation and waterdance practice. We experience ourselves as breathing beings that allow their cells, souls and bodies to expand and condense. We explore external and internal breathing and how the breath supports our movement – alone and together, in water and on land. We explore our center and our limbs as well as their relationship to each other through movement and touch as a basic organisational principle of the moving body. We explore how this principle supports our Contact Improvisation practice on land in all levels in space and in the water. We find freedom, choices and directions in moving towards and away from each other. We experience our spine as an alive, mobile and resilient structure that can support ourselves and others. We explore our soft and strong spine in solo movement and in contact with another body, in water and on land. We explore how the modulation of the tone of the spine serves different situations in relation to gravity and the full or partial weight of another body. EVERY DAY WE WILL BE FOR ONE SESSION ON LAND AND FOR ONE SESSION IN THE WATER (EITHER POOL OR OCEAN). Please bring noseclips, goggles and a wet suit (1,5 – 2 mm; shorties are fine). I will also bring noseclips to buy for 5 € or to borrow for a deposit of 5 € which you will get back when you bring back noseclip. I have a few extra wet suits but only female model only and small size. There are cheap wet suits that you can buy for example in “Decathlon” shops for 15-20 € (https://www.decathlon.de) or other places. If you commit and pay for both moduls – you get a discount of 10 %. If you are participating in the Contact meets Waterdance Gathering – you get a discount of 10 %. There is a limited amount of full and partial scholarships available. Please apply with a letter of motivation and a description of what kind of support you need. You are responsible for finding your own accommodation. On the Goa Contact Festival homepage you will find some recommendations for places to stay.